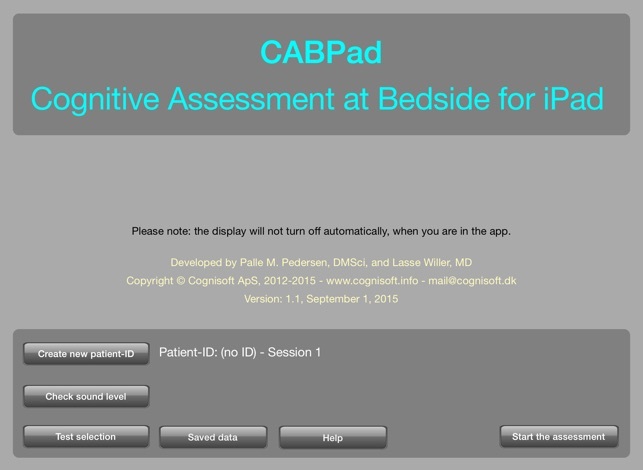 CABPad is a short neuropsychological test battery for bedside screening for cognitive dysfunctions after stroke. It was developed for a neurological research project studying remission of symptoms in subacute stroke. It may also - with caution - be used to screen stroke patients for cognitive symptoms before discharge from hospital. WARNING: CABPad SHOULD NOT be used with an iPad Mini as norming was done with a 9.7 inch screen (black frames on larger iPads). 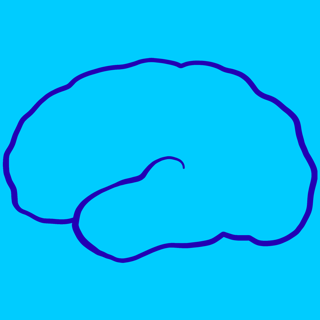 CABPad is intended to be used only by qualified staff supervised by a neuropsychologist and the results should always be interpreted in collaboration with a neuropsychologist or behavioral neurologist. 1) That the entire battery does not take too long. 2) That it measures the symptoms that typically appear after stroke. a. Hemiparalysis of the dominant hand, which can interfere with the manual responses or lead to longer response times. 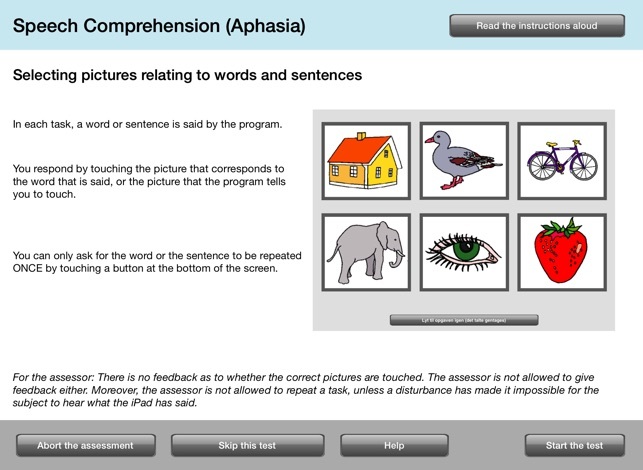 b. Aphasia, which can make it difficult to understand instructions. 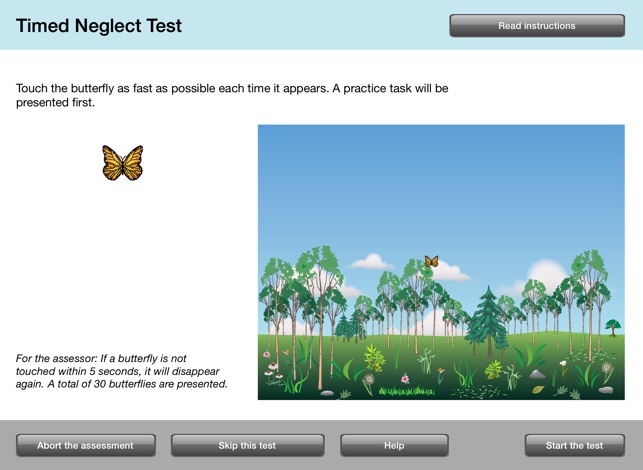 c. Neglect, which can mean that the patient overlooks stimuli to the left side of the screen. CABPad is NOT intended to measure all neuropsychological symptoms after stroke, just the most common and significant symptoms. CABPad is structured so that it is possible to select individual tasks if you have limited time available or if you do not need to take the whole battery. 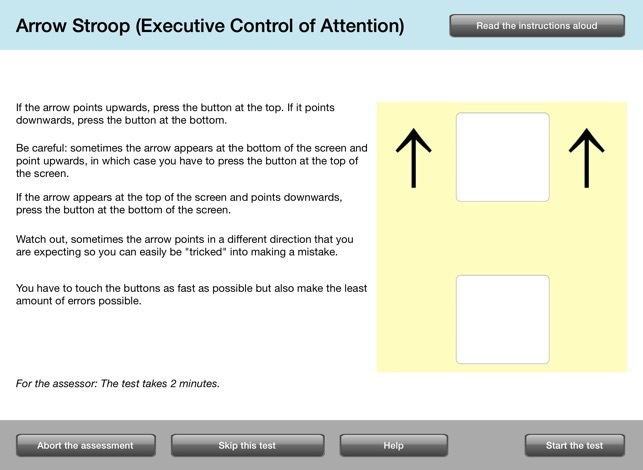 You can select and deselect tasks on the introduction screen or skip tasks as one proceeds with the test. CABPad automatically saves test results as a readable text and as a semicolon separated file that can be opened in Excel, R or SPSS. Results are saved not only when a test is completed but also if the program for some reason completely stops. The results are shown as soon as a test battery is completed. You can also access test results by pressing the "Saved data" button on the introduction screen. You can also print results from this page. A result assessment is provided on the basis of norms collected from 43 elderly healthy controls from an age group that is relevant with regards to stroke (average 69 years). Test results that are normally distributed within the healthy group are provided as T-scores. With regards to anosognosia, aphasia, and neglect, it does not make sense to increase the task difficulties to such an extent that they lead to a normal distribution within a healthy control group. Instead, for these tasks, the program reports whether the results are under or over the cut-off point. Results are saved on the iPad in two formats: 1) as a readable text format that you can open in a text editing program, 2) as a semicolon separated CSV file that can used for research. You can print results directly from CABPad using AirPrint. Data (CSV and text) can be transferred to a Mac or Windows computer via iTunes and by e-mail. The app contains English, German, Italian, Portuguese, Brazilian Portuguese and Danish language. A validation of the test battery was presented at The International Stroke Conference, Feb 2015: L Willer, PM Pedersen, A Gullach, HB Forchhammer, HK Christensen: Assessment Of Cognitive Symptoms In Sub-acute Stroke With An iPad Test-battery. Stroke 2015; 46: ATP415. Updated to work efficiently with iOS 12. Black borders on iPads larger than 9.7 inch in order to use norms obtained with 9.7 inch iPads. Requires iOS 12.1 or later. Compatible with iPad.